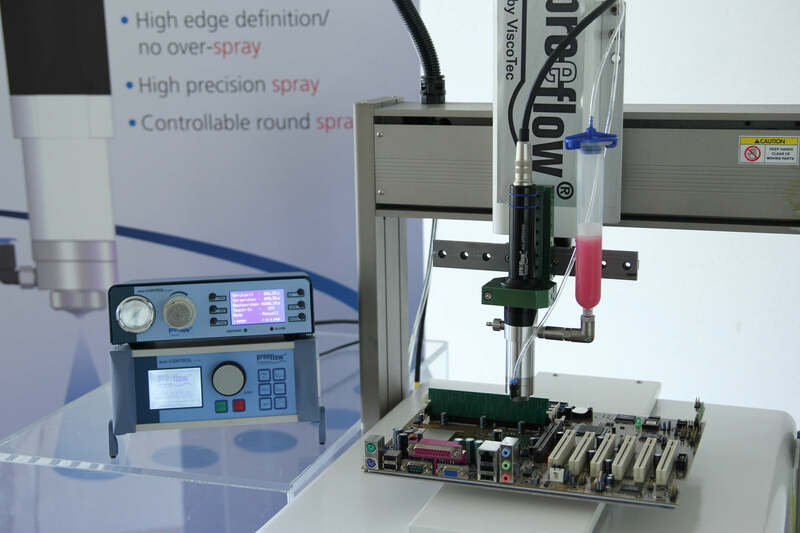 ‘Volumetric spraying’ was the preeflow motto on the exhibition ‘productronica’ in Munich. The brand new precision volume dispenser eco-SPRAY, made by ViscoTec, is suitable for various applications in different spraying areas. 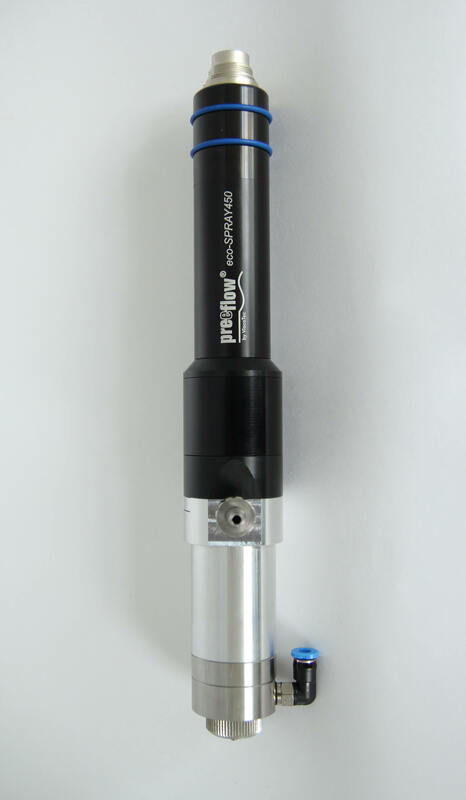 The revolutionary combination of the reliable endless piston principle and a low-flow spray chamber guarantees perfect spraying of low to high viscosity fluids – with high edge definition! The precise nebulization and spraying can take place continuously or punctually. Application areas are dosing, coating, micronebulization, greasing and marking next to many others. Constant amount per area, uniform coating, controllable round spray – these are only a few advantages of the new development from ViscoTec. Next to technical features like spraying of defined quantity, viscosity and primary pressure independent spraying or a controllable spray area, also the absolutely precise dosing manner and the attractive design, which blends perfectly with the appearance of the already designed and approved preeflow dispenser. During the development of the innovative spraying dispenser, customer benefits enjoyed highest priority: Flexibility thanks to viscosity independence and a variable spraying pattern, cost savings due to reduced waste and altogether higher process reliability. The preeflow products are marketed by international sales partners worldwide. For more information about volumetric spraying and the eco-SPRAY please click here.